Why is your dad in jail?The attempted murder of his third wife or girlfriend. I'm not sure of her title since according to Dad he never officially divorced his second wife. I've since learned from court records that he and his victim were not married even though he says they were. How long has he been in prison? He was arrested June 27, 2002 and sentenced in October 30, 2002 to 20 years with a possibility of parole after serving 10 years. On June 27, 2012, the Board of Pardons and Parole denied his request for release. This was expected as it was his first time eligible for parole and he's a violent offender. He has since had parole denied in 2014 and 2016. He will be eligible for parole again in 2018. If you ask him, he is not. If you ask the officers who arrested him, he is. Twelve of his peers agreed with the officers. His request for an appeal was denied. Read how the press reported it. Update: After reading my memoir, Dad comes to terms with the truth. Read his reaction here. Was this the first time he ever did anything like this? No. At the time of the attempted murder, he was on probation for spousal abuse committed against the same woman he tried to kill months later. Years before, during the summer before my senior year in high school, he assaulted my mom over the course of several hours. Had I not been there to stop him, who knows how things would have ended. Did he go to jail for hurting your mom? No. This was Texas in the days before the Violence Against Women Act (VAWA) became law. What happened behind a family's closed doors was their business, a heinous unwritten "don't ask, don't tell" policy. The cops simply told Dad to leave. He did. Then came back a few minutes later even more enraged. The cops came back and arrested him for aggravated assault with a deadly weapon. He never served time because my mother would not press charges or testify against him, typical behavior for an abused woman in her position. Today's laws thanks to VAWA would have remedied this injustice. What happened to the man you married when you were in high school aka "The Sailor"? He is in his home state of Ohio, married to his second wife for over 20 years. I still talk and visit with him and his family regularly. I can't thank them enough for saving me; for taking me in and loving me. I was destined for not so great things with no real family of my own to help me and he and his family changed that. Why are your parents deaf? My dad and three of his sisters were born deaf but six other siblings were not. So, who knows. There was never any history in his family and no one has been deaf since. My mom was born hearing, so she can speak. Very beautifully, in fact. Her hearing rapidly deteriorated so that she began attending deaf school at age 16. Her sister was born deaf as were both of her parents (my grandparents) and her mother's brothers and sisters were all deaf. Then why aren't you deaf? Dad's genes overrode Mom's, I guess. The statistic is that 90% of deaf children are born to hearing parents and 90% of deaf parents have hearing children. Mom's family is an anomaly. Yes. Growing up with a Deaf family that uses American Sign Language ("ASL") is like growing up around any other language. For example, if my parents spoke only Spanish, I would be fluent in Spanish instead. Then how did you learn to talk? Because I'm not deaf. By hearing the world around me: television, radio, people in stores, my older hearing brother, other children, etc. I actually began speaking in ASL first as a baby. I signed my first word ("Daddy", of course) at only five months of age. 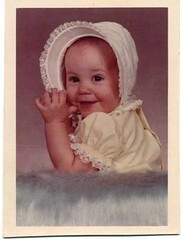 This photo was taken when I was six months old saying "Mama" in sign language. By the time I was sixteen months old, I was speaking fluently and singing songs in both voice and sign language. So if you ever questioned the validity of those studies with babies and sign language, don't!